Paper Folders. 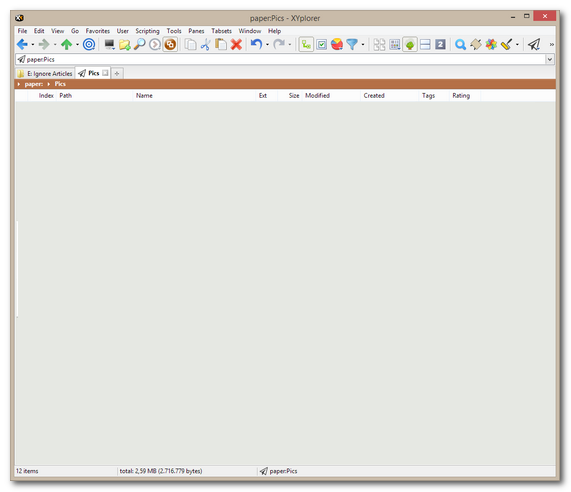 Paper Folders are a ground-breaking new implementation of virtual folders. Fast, light-weight, easy-to-use, portable. You can have as many as you want, and you will want many. 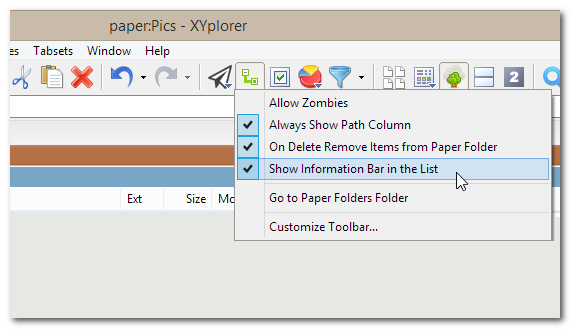 Paper Folders can be used just like normal folders in virtually all contexts in XYplorer: You can bookmark them, search them, filter them, branch view them, tag their items, generate reports on them, copy their stuff, paste stuff into them, drag stuff into them, color their contents, customize their icons, cache their thumbnails, show custom columns for them, save their folder view settings, etc. The crucial difference to normal folders is: They can contain items from all over your system, a hand-picked selection of file and folders. And they take up almost no space and not a single byte is copied to "fill" them since internally they are just lists of pointers to items. Technically, Paper Folders are simple text files that contain the full paths to items, one per line. The files are formatted as UTF-16LE and located by default under the application data folder in the subfolder "Paper". You can open and edit them in every editor. It's just a plain list of items. Functionally, Paper Folders are comparable to so-called Drop Stacks. To create such a Paper Folder you can use the command New... found in menu View | Paper Folders. Alternatively you can paste for example "paper:My Collection" into the Address Bar and press Enter. If the folder does not exist you are prompted to create it on the fly. A piece of cake. Another way to create a Paper Folder is to turn a normal folder into one using the command Toggle Paper Folder in menu View | Paper Folders. This method is especially useful with search results that you want to preserve for later use. 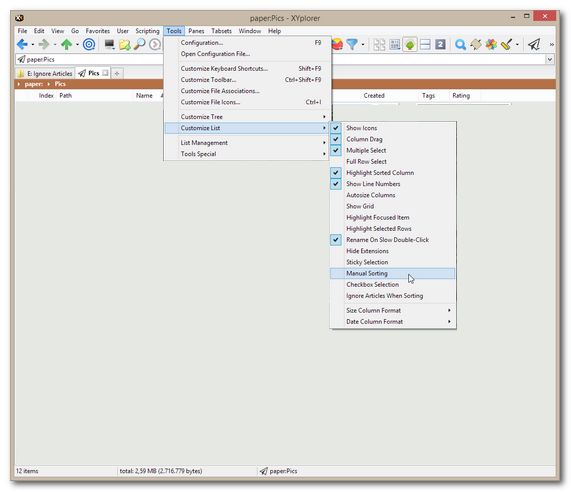 The easiest way to populate an existing Paper Folder is by dragging or pasting files into it. Paper Folders are automatically saved behind the scenes, you don't have to care about this. The Paper Folder dropdown in the Breadcrumb Bar lists all your Paper Folders. There is a toolbar button "Paper Folders" (see Tools | Customize Toolbar... Ctrl+Shift+F9) with a couple of related settings in the button's right-click menu. One of them, Show Information Bar in the List, let's you display an Information Bar in the file list -- a strong visual hint that this folder is a Paper Folder. What's the Use of Paper Folders? 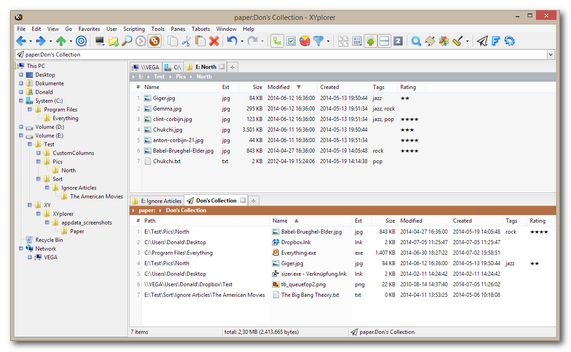 You can use them as temporary or permanent file collections for viewing or further processing. Contrary to normal folders the files in a Paper Folder can be located in totally different real locations, even all over the network. And they take almost no additional space since internally it's just a list of pointers. You can use them to store search results. Going back to the Paper Folder will often be much faster and easier than repeating the search. You can use them as light table to manually arrange photos in a custom sort order that is permanent. In teams you can easily share documents via a commonly accessible Paper Folder without copying a single byte. You can use them as simple reports since the Paper Folder files themselves are simple text files that can be viewed in any editor. You can design your virtual folders in a text editor. You can share them, and carry them along on a stick. Permanent Custom Sort Order. Now you can manually modify the sort order in a folder and it's remembered next time when you open the folder. Permanent Custom Sort Order is a feature of Paper Folders. To have it in a normal folder you first have to convert it to a Paper Folder using the command Toggle Paper Folder in menu View | Paper Folders. Here, for example, is a collection of photos in a Paper Folder in thumbnails view (with visible column headers for easier sorting). Now let's play light table and move them around. Step 1: To move them by mouse to new positions you first have to enable Manual Sorting for the current list. This toggle is found in menu Tools | Customize List. The new custom sort order achieved by manual sorting. 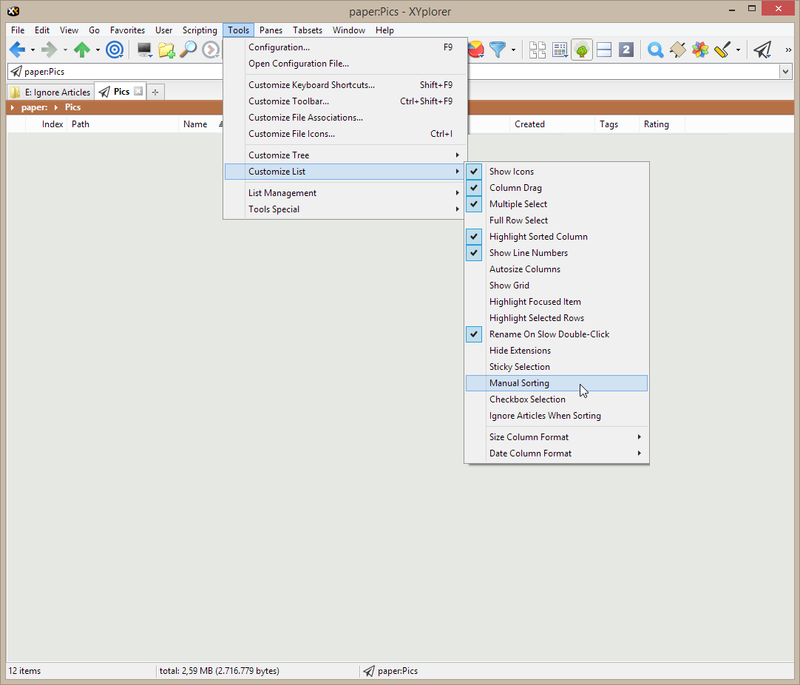 Step 3: Now Save the Paper Folder (menu View | Paper Folders | Save). The custom sort order is now permanently saved to disk. Done. Tip: Instead of explicitly saving the Paper Folder you can as well go to any other folder or tab and then back to it. It will be automatically saved. Note that the Index column holds the Permanent Custom Sort Order, so you can easily switch between standard sort orders and your custom sort order. Of course, the order is preserved between tab switches and XYplorer sessions. It is simply saved in the Paper Folder source file. Hey, you could even modify it directly in that source file! Enjoy your new light table!